Emma is one of the children aided by Foster Care. Courtesy Photo. Happily munching on a fresh carrot stick and playing with cookie crumbs, 3-year-old Penny Jones was curious about everything. Her large brown eyes darted everywhere while a smile lit up when a plastic cup of juice was placed before her. 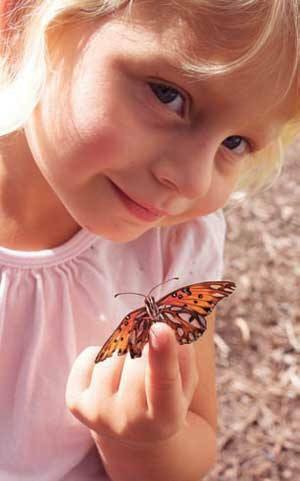 "You grow in my heart," said her mother, Charlotte Jones, while tickling Penny's nose. "You grow in my heart." Penny was 20 months old when she first came into Ms. Jones' life through Angels Foster Care, the first local foster family agency in Santa Barbara County to specialize in the unique needs of foster babies aged 2 years and younger. Founder Meichelle Arntz, who owns Recipes Bakery in Santa Barbara, said she became familiar with child welfare services and the courts through medical background and her volunteer experiences in the local Court Appointed Special Advocates program. One of her cases included two brothers who had moved through seven different foster homes within the span of a year, a shocking revelation to Ms. Arntz. During their infancy and early years, it is vital for children to have the continuous presence of a nurturing parent. Unfortunately, foster infants in the Santa Barbara County system are moved an average of three times before their first birthday and often do not have the opportunity to form secure bonds with their caregivers during this critical development period, Ms. Arntz said. "When the kids are moved so often, they begin to form attachment disorders," she said. "It is a learned behavior which starts at a very young age, so I wanted to create a program that would focus on infants to find stable families, so they can successfully bond and attach to people who really care and love them." Since the agency's inception in 2006, more than 100 local kids have been placed in homes. But because finding willing families remains a challenge, Angels has had to turn away 30 percent of infants referred by the county Department of Social Services. The idea of foster care, Ms. Arntz said, still scares people. "When people think foster care, they immediately believe all the kids have 'problems,'" Ms. Arntz said. "But these kids are no different from anyone else. They really just need a loving environment after everything they have been through." Through the county's foster care program, a family can take as many as six children at one time and there is no long-term commitment. Angels has created its own set of precise and rigorous rules to ensure it places child with the right families. Under Angels' representation, each family can only commit to fostering one child or a sibling group at a time until the child is either reunited with the birth family or a permanent plan is implemented, typically for 12 months. One full-time parent is required, along with physical exams, completion of a parent training program, family assessment and home inspection, completion of psychological screening, and making sure the family has financial stability. Typically, more than 60 percent of Angels foster parents end up adopting the foster child. When Ms. Jones decided to welcome Penny into her home, she didn't think she was going to stay forever. "My husband and I tried and tried to have a baby, but we just couldn't," Ms. Jones said. "So we thought about private adoption. We never thought about foster care. When we found out about Angels, we decided to give it a try." The first thought that came to Ms. Jones' mind when deciding was the stigma society places on foster children. "You have to realize it is no fault of the child that ended up in the foster care system," Ms. Jones said. "It's important to remember they've had to go through so much and because of that, they have to come out even stronger. "They have had to live a very adult life," she added. "They go though experiences older 'regular' kids don't even know about." When an abused and abandoned child is put into a loving home, they do fabulously, Ms. Arntz said. "It is amazing what happens when these kids are loved," Ms. Arntz said. "It's not rocket science." Preparing to foster a second child, Ms. Jones said it meant the world to her that she is able to help a child. "The big thing for me is, I don't think you have many opportunities as an adult to make a difference," Ms. Jones said. "But this is one of them, this is saving a life."